Brookfield Properties (BPY-UN-T) has launched an innovative office design project in downtown Calgary to make space more appealing to prospective tenants. 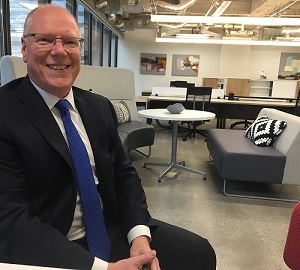 Ian Parker, Brookfield’s chief operating officer for Canada and the Western U.S., told RENX the DesignHive concept is a spec suite design created to meet the changing needs of modern space users. “I saw this in our L.A. office and our Houston office and thought given some of the difficulties in the Calgary marketplace, it would be a good opportunity to showcase what can be done in a classic downtown office building for tenants looking for creative, different kind of space,” said Parker. “We’re seeing tenants have the opportunity to return to the downtown core. It really is the easiest place for individuals and their employees to get to. The downtown Calgary office market has seen elevated vacancy rates due to the collapse in oil prices that began in late 2014, causing recessions in 2015 and 2016 in the city. Although the economy has bounced back, albeit at a slow pace, the vacancy level remains elevated in the neighbourhood of 25 per cent. Recently, Brookfield held its DesignHive Showcase where real estate professionals were given a tour of three office spaces in the downtown Royal Bank Building, designed by three different architectural firms – each showcasing a next-generation work environment. DesignHive offers immediate leasing and move-in opportunities for smaller tenants. Designers Kasian Architecture, Shearer Design and Zeidler Architecture were each invited to build a suite, of about 4,000 square feet, for a tenant looking for modern, collaborative, creative, unique space in the marketplace, said Parker. “I think they all hit it out of the park,” he said. “At present we’re building out a floor of spec suites in Brookfield Place at the same time. It’s about the marketplace. The larger tenants in Calgary aren’t as active in the marketplace today, but we are seeing a lot of returning tenants to the downtown core. He said the idea was to create some “buzz” around what can be done in a typical class-A office building. Brookfield has eight properties in downtown Calgary totalling 6.8 million square feet – Fifth Avenue Place, Suncor Energy Centre, Brookfield Place, Royal Bank Building, Bankers Hall West, Bankers Hall East, Bankers Court and Bankers Hall Retail. Brookfield Place is the latest downtown Calgary office tower at 56 storeys and 1.4 million square feet. The anchor tenant is Cenovus Energy, which originally leased about a million square feet in the development. The company is expected to move its employees from the Bow Building sometime in 2019. Parker said the tower is 91 per cent leased with an average lease term in excess of 12 years. “We’re just finding other creative ways to continue to chip away at that existing vacancy,” he added. “We’re really operating in two markets now, Toronto and Calgary. . . . And Toronto’s market is the complete opposite of Calgary’s today. Parker said it’s been a tough three or four years for the downtown Calgary office market, but the city is seeing a return to the core as Beltline and suburban tenants find their way back downtown. Erin Gardiner, an associate with Shearer Design, said Brookfield’s objective in the DesignHive showcase was to design the office space of the future. “We set out to design something that we wanted to showcase to our potential clients, our current clients . . . what could be if you worked with us,” said Gardiner. “This adds a sense of excitement and value to the real estate industry that isn’t there, because a lot of people can’t see what a space can be when they see it in a concrete shell and a lot of times they don’t necessarily have the time, the patience or the money to do this kind of development. Karen Iredale, an associate for interior design at Kasian, said the goal was to take a blank slate and create an office that would be lease-ready in the Calgary market. “The whole design premise of this space was a choice of how to work and where to work, so we can accommodate in this space anywhere from 20 to 32 people depending on their work styles,” she said.